The „Thinking on the edge” game is a strategic thinking lab, which allows to verify the theory and knowledge learned during training on the spot. 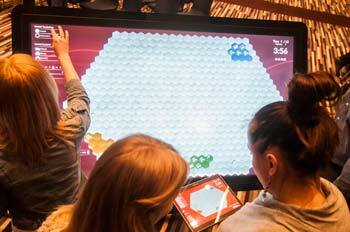 The game is played on large touchscreens, tablets and a projector. Technical aspects of the game, combined with simple rules it is based on allows for fast learning of the game. Once you understand it, all that matters is playing the game: building your country on the map, raising buildings, moving troops and negotiating with other teams. However, for those actions to make sense, there need to be deliberations between parts of the game, based on the knowledge learned during lectures. Our game is not a business simulation. Our approach is universal, which is applicable in many contexts. Our experience proves, that learning strategic thinking outside of the business context is much more efficient and leads to better results. Notwithstanding, during deliberations, lectures and cases we reference business situations.